Congratulations to Kelly A. Detwiler (B.S.-Music Education '90) who was named the 2014 Outstanding Music Education Alumni Award winner. Detwiler serves as director of orchestras at Altoona Area High School and Altoona Area Junior High School. In addition her conducting work, she teaches AP Music Theory and Harmony, and conducts the Altoona Area High School pit orchestra. 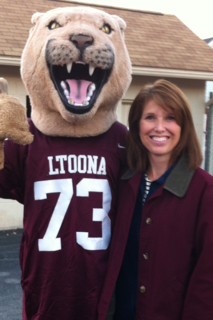 She has taught in Altoona since 1990. Since her arrival in Altoona in 1990, the orchestras have thrived and continued to build in both numbers and accomplishments. Both the high school and junior high school orchestras have been honored with superior ratings during music festival competitions. Each year, students from the high school orchestra are selected for the all-state orchestra level of the Pennsylvania Music Education Association. She has received many grants throughout her years of teaching, including a grant from Sy Brandon for a commissioned work for full orchestra. She has teamed with the Altoona Symphony on many projects including side-by-side concerts and apprenticeships, and she has been awarded a $5000 grant for a summer string camp program. Her smaller ensembles give back to the community each year with many performances for community events and causes. In addition to her teaching responsibilities at Altoona, she plays double bass with the Altoona Symphony Orchestra, freelances in the community on double and electric bass, and teaches private bass lessons. She lives in Altoona with husband, Larry, and their two children.